Sister Mary Miday, OP, entered the Adrian Dominican Congregation through a circuitous route – after first being a member of the Carmelites. A native of Louisville, Ohio, she was the fifth of eight children: Verna, Walter, Marie, Rose, Mary, Howard, Margaret, and Catherine. Howard died at the age of 3 months. Working the land has been a key component of Sister Mary’s life. She lived with two grandparents, who had 10 to 13 acres of land with an orchard. They raised hogs and chickens and grew vegetables, grain, and fruit for the family and the animals. They always had a dog. Sister Mary’s father also worked in the foundry, casting iron in front of a very hot furnace. “The heat and the dust which he breathed in each day almost killed him,” she said. “Finally, his doctor told him that if he stayed there, he would have one year to live because of the damage to his lungs.” Her father then began to work for the railroad as a foreman. After graduating from Louisville High School, and after working in a factory office for a few years, Sister Mary joined the order of the Discalced Carmelite Nuns at the monastery in Elysburg, Pennsylvania, taking the name Sister Marie Zita. She went back to her baptismal name during the Vatican II renewal. She worked in the kitchen, laundry, and vegetable garden and made sandals, the only things the Carmelite Sisters wore on their feet. Originally, they were made of hemp, but eventually of leather. At the time of religious renewal after the Second Vatican Council, Sister Mary requested a leave of absence from the monastery to spend time with her aging parents. Until that time, she could not visit her family. Her mother died the first year that Sister Mary was home, so she requested another year to be with her father, who had a stroke and died that year. She was then asked to help some Carmelite Sisters in Mississippi with a project. At the end of that time, she questioned what God was calling her to, since she was now involved in active lifestyle work. To help in the discernment process, and with her Carmelite community’s support, Sister Mary served in pastoral ministry, mostly with people of color, in parishes in Mississippi, Louisiana, and New Mexico: visiting the sick and homebound, teaching catechism, and teaching young children to make and sell their crafts – all of this while living with another community. After feeling confident that she could live the active lifestyle, she seriously considered transferring to three religious communities. After spending sufficient time with each, she determined that God was not calling her to any of them. “I was about to go back to the Carmelites and tell them I was called to stay with them,” she said. “I told God, ‘You led me around the country like Abraham and here I am not finding a community you have chosen for me, so I am going back to my present community and remain there.’” However, that night, she was inspired when reading the story of Sister Maureen O’Connell, OP, who had been a police officer before entering the Adrian Dominican Sisters and was then allowed to return to police work, but in a different capacity. “I thought this was a broad-minded community. I thought I could fit in somewhere,” Sister Mary said. She visited Adrian and was convinced that this was where God was calling her, and made her Final Profession as an Adrian Dominican Sister on September 22, 1985. During her period of discernment with the Adrian Dominican Congregation, Sister Mary served as an activities assistant at St. Theresa Home in Cincinnati and earned an associate’s degree in fine arts from Siena Heights College (now University) in Adrian. She later earned a bachelor’s degree in individualized study from Lourdes College, (University) in Sylvania, Ohio, and certificates in occupational therapy and gerontology. From 1989 to 2005, Sister Mary served in occupational therapy at health care and rehabilitation centers in Florida. She then served in volunteer ministry at St. Elizabeth Ann Seton Parish in Citrus Springs, Florida, from 2006 to 2010 – taking three months off in 2007-2008 to volunteer with the people affected by Hurricane Katrina in New Orleans. Sister Mary’s special memories as an Adrian Dominican Sister include getting to know the Sisters in her Mission Groups and in the Mid-Atlantic and Florida Chapters; the fun times, especially in warm Florida; growing and sharing tomatoes; and enjoying her first fishing tournament at Lake Dardanelle, Georgia. She also recalled the times, in Adrian, of group sharing in her apartment at the Motherhouse and of quiet prayer time. Sister Therese Margaret Roberts, OP, lives in Fort Lauderdale, Florida, where she was born and raised and had lived with her mother for 40 years. Yet, she is anything but a homebody: she has traveled to every continent on Earth. She was born in 1926 to one of the first families to settle in Fort Lauderdale – even before the city was chartered. “I come from a pioneer family,” she said. The only child of Protestant parents, Sister Therese Margaret began in second grade to attend St. Anthony School, where she was taught by Adrian Dominican Sisters. Just before graduating from high school, she decided to become a Catholic and ultimately entered the Adrian Dominican Congregation. Sister Therese Margaret was an elementary school teacher for several years, in Michigan, Florida, and Puerto Rico. Her last formal assignment – before Sisters participated in discerning their ministries – was as a teacher for eight years at St. Thomas Aquinas High School in Fort Lauderdale. Sister Margaret Therese then spent the remainder of her formal ministerial years serving in public schools. Her experience was wide and varied – and in many cases gave her the opportunity for world travel. She developed a program for gifted middle-school students in Broward County, Florida. During one Christmas break, she traveled to Russia with her principal, experiencing the dangers of traveling in a Communist nation and the fun of riding on the Orient Express and in a troika, a horse-drawn sled. Still under the auspices of the public school system, Sister Margaret Therese then served for seven years as the director of education for the South Florida State Hospital. She obtained grants for a small train to transport students across campus every day to the academic building or the vocational building. When Sister Margaret Therese retired after spending next 22 years as a guidance counselor at Piper High School, the school community gave her a special gift: a National Geographic expedition to Antarctica. Sister Therese Margaret believes she has always lived out the Adrian Dominican Mission in her public school ministry. Through the use of her title “Sister” on her checks and on the nameplate on the door, she ensured that everybody knew that she was a Catholic Sister. “I felt my obligation to be a good example of what a nun should be,” she said. “For many of those people – both professional people that I worked with and students – I may have been the only contact that they would ever have in their life with a nun. The majority of my work background includes teaching—predominantly preschool and special education. House Directress for Mother of Good Counsel Center for Women and Children—a center for victims of sexual abuse. Teaching, cooking, cleaning/organizing, listening to music, and reading books. To be a Dominican is God’s gift. I believe that we are called wherever He wills; it depends on our own charism, where we are fitted, and in service of God’s people. In 2007, I had some exposure to different mission areas. I was assigned to an education ministry in Tala and taught in our school in Apalit. 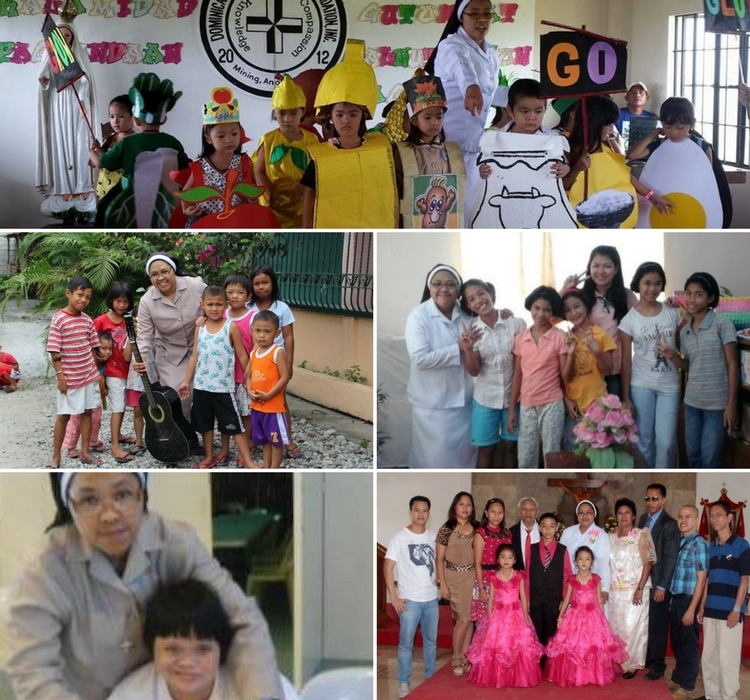 I was also assigned in pastoral ministry with the women and farmers, and in special education and with children in Munting tahanan ng Nazareth. This center for abandoned and poor children with disabilities peaked my interest and passion to serve and love selflessly and continue in my formation. Religious today can easily mingle with the faithful; a consecrated person can freely live in the world to be with God’s people – bringing the church to the people, and be a witness of love and joy, mercy, and compassion. One thing that inspires and motivates me is to serve our brothers and sisters in the peripheries. I think responding to the call is an expression of great humility and selfless offering. Getting out to the comfort zone and passionately living with people on the margins is an expression of extraordinary service in a very ordinary way. Like St. Teresa of Calcuta did.